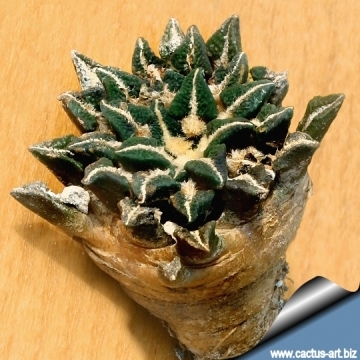 Accepted Scientific Name: Ariocarpus kotschoubeyanus (Lem. ex K.Schum.) K.Schum. This is the southern form of the species, the plants are much larger with larger, highly textured, triangulate tubercles, and a deep purple flower with little or no white content. This species start flowering when still young. Origin and Habitat: Mexico, Ariocarpus koschoubeyanus is widely distributed as a large number of small, isolated populations in a big area extending over 600 km, from central Coahuila in the north to Queretaro in the south, and the species is also found in the states of Zacatecas, San Luis Potosi, Nuevo Leon and Tamaulipas. The "elephantidens" is the southern form of the species. 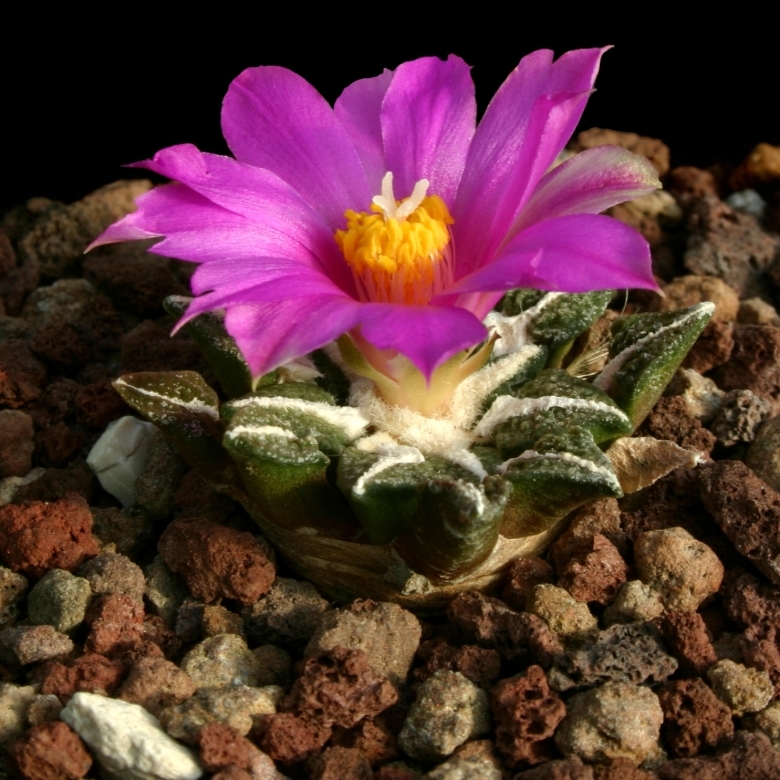 Ariocarpus kotschoubeyanus (Lem. ex K.Schum.) K.Schum. Anhalonium fissipedum Hort.Monv. ex Lem. Anhalonium kotschoubeyanum Lem. ex K.Schum. Roseocactus kotschoubeyanus var. albiflorus Backeb. Ariocarpus kotschoubeyanus f. cristatus hort. Roseocactus kotschoubeyanus f. cristata hort. 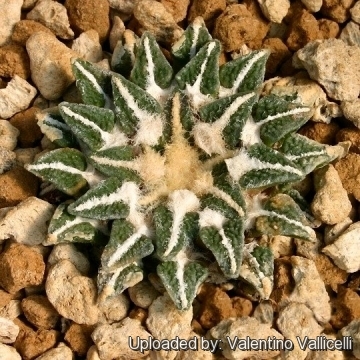 Ariocarpus kotschoubeyanus var. elephantidens f. cristata hort. Roseocactus kotschoubeyanus subs. macdowellii Backeb. Roseocactus kotschoubeyanus var. macdowellii (Backeb.) Backeb. Ariocarpus kotschoubeyanus f. monstruosus hort. Ariocarpus kotschoubeyanus f. mostruosus proliferus hort. Ariocarpus kotschoubeyanus f. rubra hort. 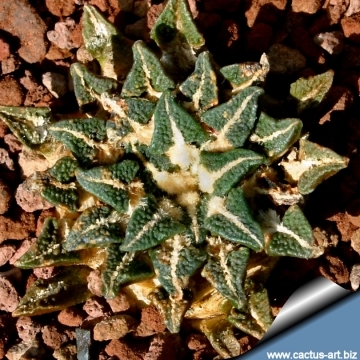 Description: Ariocarpus kotschoubeyanus are very flat geophyte cactus that produce small star-shaped rosettes. They in most cases don't reach more than only a few centimetres above the ground. Although they can form clumps, often only a small disc of tubercles can be seen flat at the soil surface, however these plants grow a large tap root below the surface of the compost. Remarks: The southerly form ( known as A. kotschoubeyanus var. elephantendens) are much larger with larger, highly textured, triangulate tubercles, and a deep purple flower with little or no white content. Stem: Usually solitary, rarely giving rise to side shoots from old areoles, flattened on top, depressed centrally. Tubercles: The tubercles are deltoid dark olive green with no spines and lie flat on the soil surface. They are more long than wide, closely packed and divergent, sharply angled apically. Areoles: The tubecles forms a central longitudinal areolar groove extending to the tips on the adaxial surfaces of the tubercles, woolly, 1-3 mm wide, 5-10 mm long. Flowers: These plants have a woolly crown, from which emerge bright pink-violet flowers up to 2.5-5 cm, 2 times wider than long when fully expanded. Flowers are diurnal and last for 3 to 4 days. The white-flowered variety was described as var. albiflorus. Fruits: White or green with lots of seed. 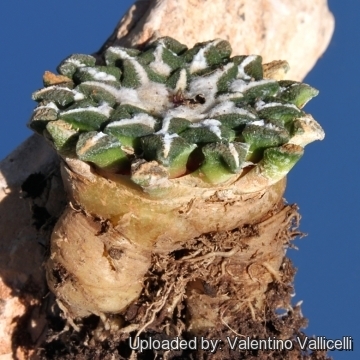 Ariocarpus kotschoubeyanus (Lem. ex K.Schum.) K.Schum. 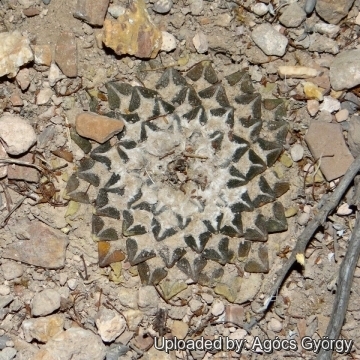 : Very flat geophyte cactus that produce small star-shaped rosettes. They in most cases don't reach more than only a few centimetres above the ground. The type species is intermediate between all the other forms and is to be found off highway 80, between El Huisache Junction and Santo Domingo. Ariocarpus kotschoubeyanus subs. albiflorus (Backeb.) Glass: This is a small growing form with white flowers described in Tamaulipas. Ariocarpus kotschoubeyanus f. cristatus hort. : The crested form is and can get relatively large making a spectacular specimen. The appeal lies in the peculiarly-shaped tubercles plus the challenge of growing it successfully. 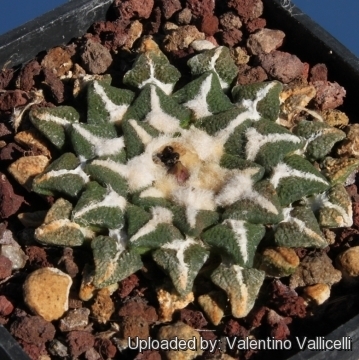 Ariocarpus kotschoubeyanus var. elephantidens Skarupke: Southerly form.They are much larger than type with larger, highly textured, triangulate tubercles, and a deep purple flower with little or no white content. 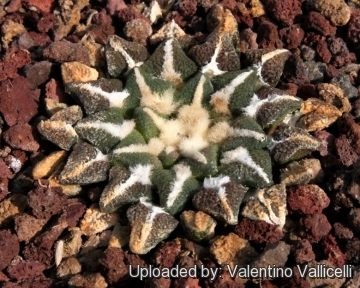 Ariocarpus kotschoubeyanus var. elephantidens f. cristata hort. : crested form with distinguishing much larger and highly textured, triangulate tubercles. 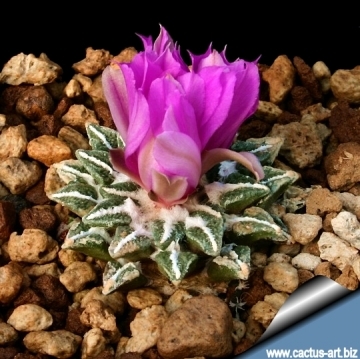 Ariocarpus kotschoubeyanus var. macdowellii (Backeb.) Krainz: This are the plants found in northern populations, they are smaller than the type, with small beak-like tubercles and pale mauve flowers, often with a high white content in the outer petals. Ariocarpus kotschoubeyanus f. monstruosus hort. : It foms monstrous bumped shapes, it is very courfull, the epidermis is dark green and contrasts with the large white areoles and new purple-red growth. Ariocarpus kotschoubeyanus f. mostruosus proliferus hort. : It is a very proliferous form with thin dark heads covered with tiny contrasting white woolly areole. Older plants will produce small cushions with hundreds of heads. Ariocarpus kotschoubeyanus f. rubra hort. : has tubercles of a bright orange-red colour due to the absence (or reduced production) of chlorophyll pigments. Ariocarpus kotschoubeyanus subs. sladkovskyi Halda & Horáček: Differs from the other red flowering A. kotschoubeyanus (that have a dull and rough epidermis) for having a smoother and shiny epidermis. Cultivation and Propagation: The plants need deep pots to accommodate the napiform unit formed by the stem base and the rootstock , and a loose mineral soil with a well-drained substrate. They need a good amount of light, a place near the roof of the greenhouse helps drying the pot after watering. This can be done weekly during summertime, if the weather is sunny enough, with a little fertilizer added. Kept this way, plants will show a healthy, although slow growth. They are frost hardy to -10°C. Propagation: By seeds, remembering that seedlings dislike strong light and dry conditions and need to be repotted frequently. Eventually, as they become mature, they attain a maximum size of 5 to 9 cm. But plants are often grafted to accelerate growth as they would generally take at least a decade to reach maturity on their own, but the grafted plants are typical rather tall growing, compared with plants on their own roots that are usually very flat to the ground.